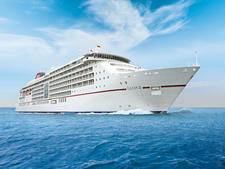 Editors' note: Hanseatic willl leave the Hapag-Lloyd fleet in October 2018. Think you have to give up creature comforts to commune with nature on an expedition cruise? Think again. 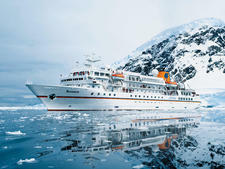 Hapag-Lloyd Cruises, a German line, combines adventure in some of the most far-flung regions of the world with luxury aboard its MS Hanseatic, the only Berlitz-rated five-star expedition vessel afloat. 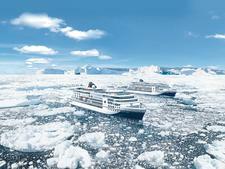 Hanseatic's small size and sturdy hull, with the highest passenger-ship ice-class rating (E4), allow it to poke into remote corners of the Arctic and Antarctic in season. At other times of the year, it roams the globe, cruising the Amazon River, the South Seas, Indian Ocean and coasts of Europe, Asia and the Americas. Ports of call range from popular stops to the little-known, including some that have never been visited by a cruise ship. In larger ports, the ship docks at piers or transports passengers by tender. To access wilderness areas, a fleet of 14 Zodiacs is deployed. These motorized, rubber rafts take eight to 10 passengers to view animals and scenery, making dry landings at docks and wet landings on shore, where passengers climb out into shallow surf. Rubber boots, as well as parkas in cold climates, are provided. You might bundle up to walk among the penguins on the Antarctic Peninsula before returning to the ship to sip Champagne. This is roughing it? 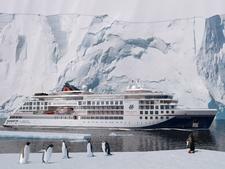 Unlike many other expedition vessels -- notably the Russian research ships chartered by some expedition operators in the Antarctic -- Hanseatic provides the comforts and luxuries of a top-notch luxury liner. You are pampered with fine cuisine, exceptional service and roomy staterooms. It's the little things -- like live orchid plants that bloom in cabins and public areas, servers who offer hot towels and cool drinks to passengers returning from excursions and overnight shoe-polishing service -- that push this ship into the top category. And yet, the atmosphere is surprisingly laid-back. The crew manages to provide an experience that is elegant and sophisticated, without being stiff or formal. As on any expedition cruise, the emphasis is on learning about the animal life, the people and the geography of the cruise destination. Hanseatic employs a team of experts and insiders to give lectures onboard and to guide shore landings. 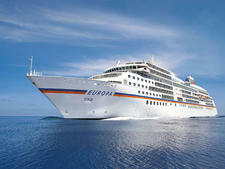 One of four vessels of the cruise division of Hapag-Lloyd, the German cargo shipping company, Hanseatic's official language is German, though the entire crew speaks English. About a dozen bilingual cruises are offered a year, offering documentation, daily programs, menus, shore excursions, announcements and lectures in English. While the overwhelming number of passengers onboard these cruises speak German, the camaraderie of a small ship cuts through any language barrier. Nods, smiles and wishes of guten morgen (good morning) abound. Those who count English among their other languages are happy to converse. And, because passengers who sign on for expedition cruises tend to have adventurous spirits and a keen intellectual curiosity, they soon find common ground. My cruise through eastern Canada carried 141 passengers, including four from the U.S., 10 from Canada, two from England, 97 from Germany and the remainder from a smattering of other European countries. The nationality breakdown varies per cruise, but on average, about 10 percent of the passengers on bilingual itineraries speak English (Americans, Canadians, British, Australians). The average age on my cruise was about 70. On more active expeditions, such as those in Antarctica, the average is around 60. Clothing is more casual on this expedition vessel than on Hapag-Lloyd's other five-star ship, Europa. Jeans, hiking pants, collared shirts and sweaters are the daytime norm. Most evenings are designated "casual/elegant," which women on my cruise interpreted as slacks, skirts or dresses. Several men wore sport coats, and a few opted for ties. On the two formal nights, there were no ballgowns and only a handful of tuxedos. Tips are included in the cruise cost. However, nearly all passengers give something to their dining room servers and cabin stewards. Currency onboard is the euro.